Home DIY Projects	Guest Room Make-Over! Happy Tuesday, Friends! I have been in full-blown cleaning mode in our basement and storage area, and it’s almost time to focus on some other projects. There are lots of ideas swirling around in my head, so come see what I have in mind for a guest room makeover with a small budget! In our new house, there are 3 bedrooms in the basement. One is used as my husband’s office. The second is used when our younger son, Nic, comes to visit. And, the third bedroom, because it has a king-size bed and an adjoining bathroom, will serve as our main guest suite and also where our son and daughter-in-law stay when they come. This is how it looks currently. For the most part, it is perfectly fine, but there are a few things I wish to change. The challenge is to use mostly what I have and spend only what’s necessary. So, here’s my plan! The room is painted a yellow-gold color, which is bright and cherry, but not really one of my favorite colors. When we moved in, there were a few holes in the walls and I tried to touch them up with paint the previous owners left behind. Perhaps the paint has faded over the years, but it doesn’t match at all. So, painting this room is a must. I think I’ll use my favorite go-to color, Accessible Beige-7036 by Sherwin-Williams. I used this color in several rooms in our last house, and really loved it. I’ll start with one gallon of paint, but it will probably take two. Here’s what I have in mind. It’s a 6-light chrome crystal chandelier from Home Depot. Pottery Barn sells one very similar but for about $200 more. See what a bargain hunter I am? I love the fact this one has 6 lights and will really brighten up the room! I’ll put it on a dimmer switch too, so that we, or our guests, can adjust the amount of light accordingly. The existing headboard is padded and covered in a semi-neutral pattern. I’ll see how it looks once the room is painted, but if I decide to change the fabric, I think it will be fairly easy to do it myself. 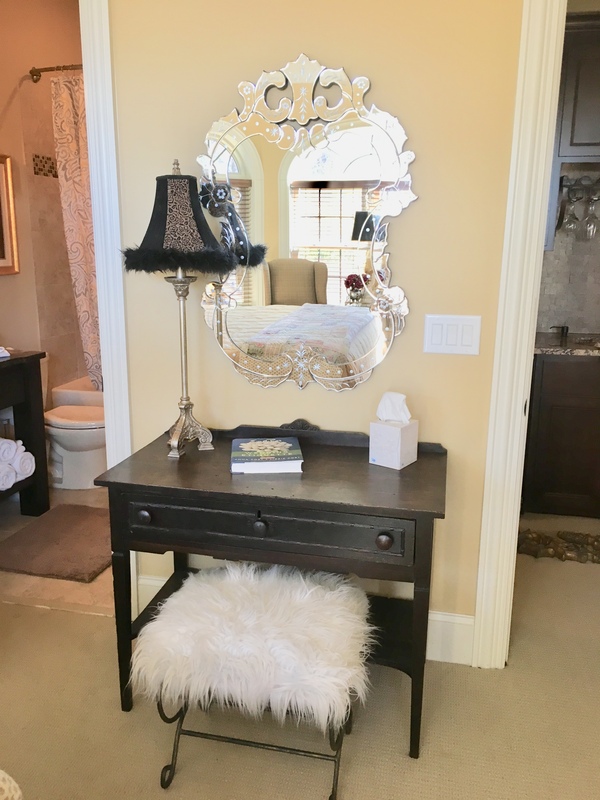 The room has a small dressing table and stool I added for our daughter-in-law so she has a place to sit down to put on her makeup, and do her hair. I’ve since decided this mirror would look better in the bathroom, so it will be moved there, and an antique mirror put in its place. Still, a perfect place for primping or to use as a desk. I found this full-size dressing mirror when we moved in. I plan to mount it on the back of the closet door with some pretty, vintage-style mirror clips. I have two of my favorite wing chairs in this room. They were recovered a few years ago in a brown tweed, reminiscent of vintage menswear. They make a cozy reading spot for guests, and are a good place to put on shoes, etc, These will stay in the room but I may move them to another spot. The adjoining bathroom will also get an update. And while I’d love to get a new vanity and sink, this one will have to do. For now, I’ll replace the sconce and the mirror with something more feminine. The short-term plan is to paint the bathroom to match the guest room. I’d also like to replace the curtain rod with a straight one so it takes up less visual space. I want to find a more neutral and feminine shower curtain to off-set the masculine brown tile. I’ll add some pretty artwork I have on hand. Collage Frame via Thrift Store! Vintage Dresser turned into Bathroom Vanity!